Can You Do Anything to Fight Hair Loss? The short answer is yes, you can! 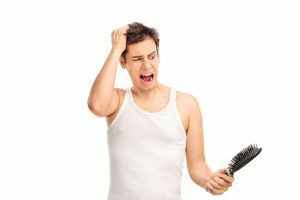 Is anything more distressing for a man than hair loss? While most causes of hair loss are genetic, there are a few lifestyle changes, supplements, and natural foods you can employ to prevent or lessen hair loss. Because of the aging process, collagen levels in the body naturally decrease. Collagen is one of the building blocks of healthy hair, skin, and bones, and therefore, is an excellent supplement to take to prevent or treat hair loss. Many people who take collagen supplements daily find that their hair grows longer and thicker. Typically, collagen supplements are powdered and tasteless, and can even be added to your morning cup of coffee without changing its texture or flavor. Besides helping with hair growth, you might find that after supplementing with collagen on a regular basis that your skin looks younger and that your joints are more pain-free. Another building block of hair is protein. If your dietary protein intake is insufficient, you might find your hair to be thin, brittle, and dull. Or, you might discover that you’re losing more hair than usual. It’s best to consume complete proteins, which are those that contain all of your essential amino acids, like dairy, meat, and legumes. It may be helpful to supplement your diet with protein powder in order to boost your daily levels of protein. Protein-rich foods are eggs, cheese, meat, legumes, nuts, fish, and soy. So, take a look at your diet, and track how many grams of protein you are eating on a daily basis. You should aim for 1 gram of protein per pound of body weight. Omega 3 fatty acids are vital for a healthy body and a healthy head of hair. Omega 3s have been shown to promote hair growth, prevent hair loss, and improve hair health by hydrating the follicle from the inside out. Dry, brittle hair tends to break off, so adding this fatty acid to your diet will ensure you’re your natural scalp oils are plentiful. 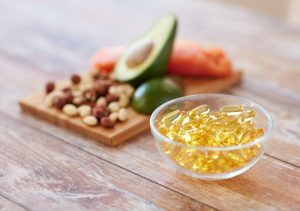 Dietary sources that are rich in Omega 3s are fatty fish (i.e., salmon, mackerel, sardines, and fatty tuna), flax seeds, walnuts, chia seeds, and Brussels sprouts. If you don’t get many of these foods through your meals, you may want to supplement with a high-quality and well-reviewed fish oil capsule. Vitamin A has been proven to be an essential part of the equation when it comes to healthy hair growth. Apparently, Vitamin A’s antioxidant properties help the hair follicle to detox and maintain a robust structure. Some foods that have high levels of Vitamin A are carrots, sweet potatoes, liver, spinach, dark leafy greens, squash, dried apricot, and mango. Try to include one or two of these in your diet each day to address thinning hair issues. If you don’t enjoy foods that are high in Vitamin A, look into supplements. Of course, consult your healthcare provider before beginning any new supplements. Several reputable scientific studies have shown that smoking cigarettes can increase hair loss, and lead to premature greying and balding. If you haven’t quit because of all of the other detrimental health effects of smoking, the added desire to keep your lustrous locks may push you to finally pull the plug on smoking. Smoking depletes your collagen, decreases the amount of oxygen that gets to your hair follicles, and can disrupt your hormones. All of these side effects promote hair thinning and loss. 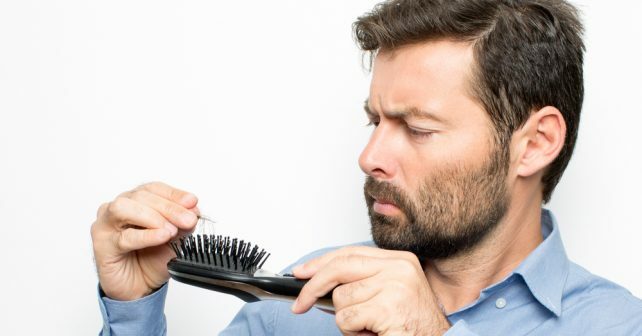 It’s been found that a hormonal imbalance in men can lead to hair loss. The main culprit is testosterone. If your testosterone levels are lower than optimal, one of the many side effects is losing your hair. So, if you are experiencing premature hair loss or male-pattern balding, see your doctor and get your hormone levels checked. It’s possible to address hormone deficiencies with medication and diet and lifestyle changes. High levels of stress can impact every part of your life in a negative way, including the health of your hair. Some research studies have found that higher-than-normal levels of stress can push some hair follicles out of the “growth phase” into the “resting phase,” thereby leading to quicker hair loss. In addition, some people cope with stress by pulling their hair excessively or running their hands through their hair too much. These two actions can both lead to increased hair loss as well. Finally, an auto-immune disorder, known as alopecia areata, can be caused by stress. Alopecia areata is an acute loss of hair from all over your body due to your immune system attacking your hair follicles. If you are experiencing hair loss, try to determine what the key causes of stress are in your life. If they can somehow be mitigated, be proactive in addressing them head-on. Find ways to relax and lower your stress levels throughout the day as well. Exercise, diet, talk therapy, meditation, yoga, and just laughing more are all ways to decrease your overall stress levels. Not only will drinking green tea help with hair loss but actually applying it to your scalp can have some benefits too. Brew two bags of high-quality green tea in one cup of water, let it cool and pour the brewed tea on your hair. Allow it to penetrate your scalp and hair follicles for at least an hour then rinse it out. If you wake up every morning and glimpse more and more lost hairs on your pillow, it may be time to take stock of your diet, lifestyle, and overall wellness to see if you can somehow thwart the not-so-inevitable process of losing your hair. Hair loss and thinning can negatively your affect self-esteem and overall quality of life, so it’s worth it to try and make a few changes that might help to hold on to those locks.